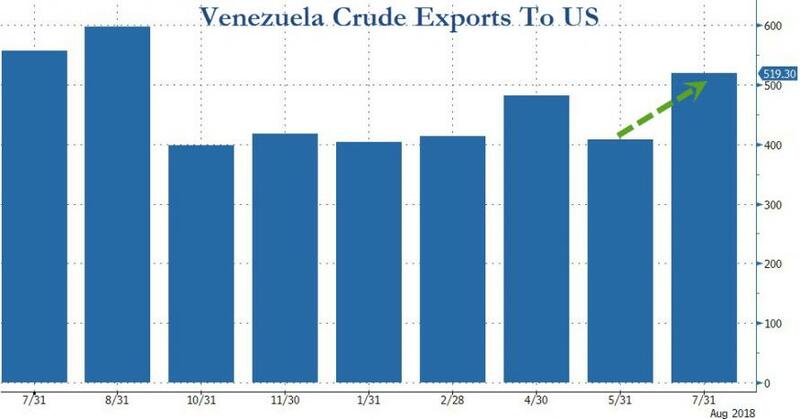 Analysts widely expected sanctions on diluent the US was exporting to Venezuelan refineries first, followed by a prohibition, perhaps phased in over a matter of months, on imports of Venezuelan crude into the US. It was unclear if US refiners, who had long imported Venezuelan crude, would be allowed to continue under an interim “grandfathered” arrangement, but analysts mostly agreed that sanctions were coming. At the time, the US was importing about 800,000 b/d of Venezuelan crude and the administration was mostly concerned about the impact an import embargo would have on US Gulf Coast refineries, which would need to look for new sources of heavy crude. Oil sector sanctions from the US seemed so likely that then-US Secretary of State Rex Tillerson told reporters that the administration was looking at ways to soften the impact of the sanctions once they were imposed. “We’re going to undertake a very quick study to see: Are there some things that the US could easily do with our rich energy endowment, with the infrastructure that we already have available – what could we do to perhaps soften any impact of that?” Tillerson, the former CEO of ExxonMobil, said. A year later, the US is importing less crude from Venezuela (about 530,300 b/d in July, according to preliminary US Customs data), but Gulf Coast refiners, particularly Valero, continue to rely on these imports. In fact, US refiners may be importing even more, if Venezuela’s oil sector was not seemingly in a death spiral. Roughly one if every five barrels of oil imported by US Gulf Coast refiners comes from Venezuela. The EIA forecasts Venezuelan oil production to fall below 1 million b/d by the end of this year, down from 2.3 million b/d in January 2016 as joint ventures fall apart and PDVSA, the state-owned oil company, struggles to feed, let alone pay, its workers. PDVSA has notified international customers than it cannot fully meet crude supply commitments and the country’s active rig count has fallen below 30, according to Baker Hughes International Rig Counts. By the end of 2019, Venezuelan crude oil output is expected to plummet to 700,000 b/d, making it likely that it will produce less than the US state of New Mexico. 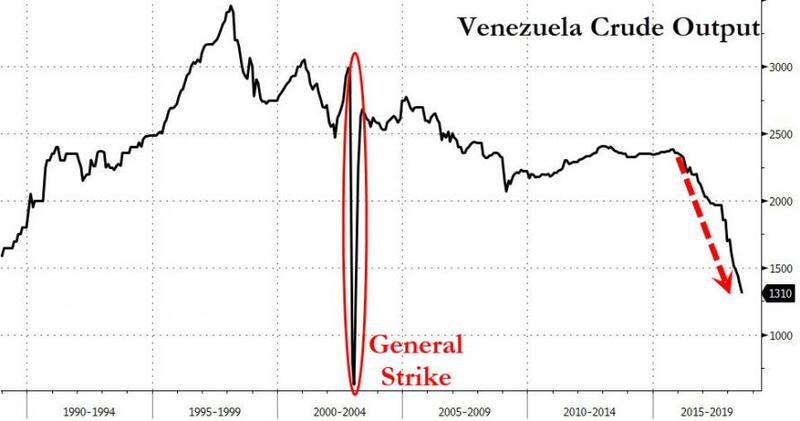 The downfall of Venezuela’s chief industry, coupled with International Monetary Fund predictions that inflation in the country will skyrocket to 1 million percent by the end of this year, have created an unusual scenario, in which Maduro may even welcome US sanctions on its oil sector. As Venezuela’s economy continues to unravel, leading to surging prices and rampant hunger, Maduro could try to pin the blame on sanctions. The US has sanctioned individuals in Venezuela, including Maduro; prohibited the purchase and sale of any Venezuelan government debt, including any bonds issued by PDVSA; and banned the use of the Venezuela-issued digital currency known as the petro. But oil sector sanctions are viewed as the most powerful penalty remaining and one the Trump administration is more hesitant than ever to use. David Goldwyn, president of Goldwyn Global Strategies and a former special envoy and coordinator for international energy affairs at the US State Department, speculated that it would take extreme action, such as a military assault on a civilian rebellion, for the US to now impose oil sector sanctions. “The system is collapsing and this administration does not want to own the collapse,” Goldwyn said. The path ahead for Venezuela’s oil sector has, likely, never been less certain. And it remains to be seen what a full collapse of an economy looks like. It is clear, however, that the US wants to avoid blame for accelerating that collapse and has abandoned, at least for now, consideration of oil sanctions. When Venezuela’s oil sector hits rock bottom, the US does not want to be accused of dragging it there.